Gary and I had scheduled a Monday morning meeting in Chicago that required us to go there Sunday. So we decided to make the most of inconvenience and go out for a very good meal that Sunday night. And what a meal we had. We knew about the meeting a month out so we had time to decide and get a reservation. So we created a list of possibilities and narrowed the list down to Table 52. This is Chef Art Smith’s place in Chicago which features Southern Cooking. I have seen Chef Smith several times on Iron Chef America and Top Chef. He was Oprah’s personal chef, recently cooked for Lady Gaga and President Obama and Michelle ate at Table 52 for Valentine’s Day so there was a really good chance it was going to be memorable. And it was. Gary started his meal with the Southern Pickles. 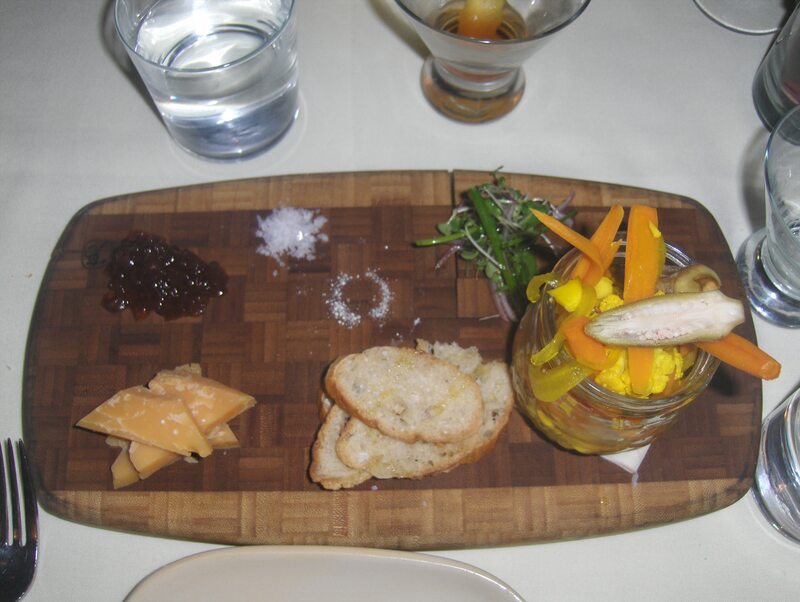 The dish came with several house-pickled cauliflower, carrots and okra with micro greens, onions, two kinds of salt, baguette, smoked gouda and jelly on the side. The idea was to make your own pickle sandwich out of the ingredients trying the different ingredients. I like participation dishes like this where you can choose your own combination of food so when Gary offered a taste, I went for it. The pickled vegetables were tender and sweetly pickled but not to the point where the taste of the vegetable was lost or the crunch was gone. The rest of elements added interesting tastes of sweet jam and salty salts along with different textures of crusty bread, crunchy pickles and gooey jam. Combining the different elements of the dish was fun but we both agreed that although the gouda cheese was fine on it’s own we couldn’t find a combination that matched well with the cheese. I went for the Beet Salad for my first course. 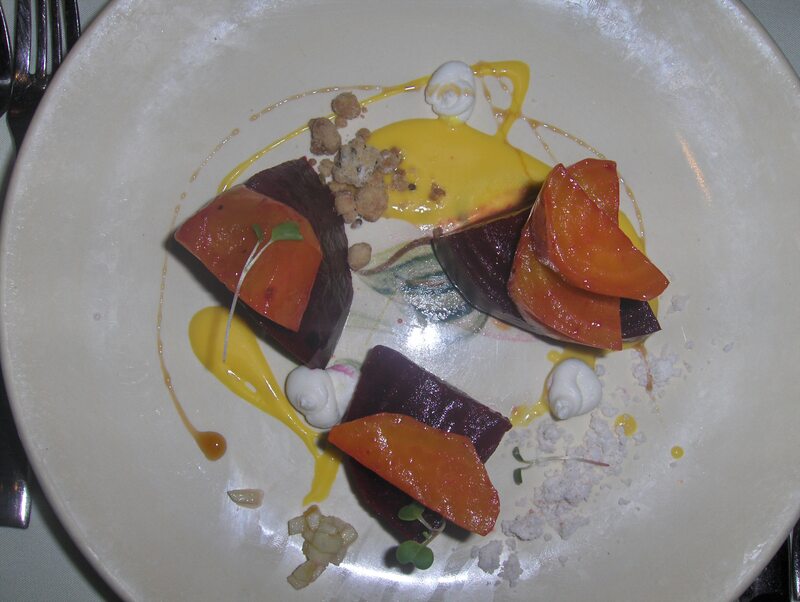 The salad came with nice portions of two colourful beets, whipped goat cheese, thyme crumble and Myer lemon puree. For what I thought was going to be a simple salad turned out to be a very complex dish by the various combination of items you could put on your fork. The sweetness of the beets matched well against the tartness of the Myer Lemon Puree and the almost metallic flavour of the Thyme Crumble. The textures of the dish also provided a spectrum of densities, firm beets, semi soft Whipped Goat Cheese and thick puree. We wanted wine with the meal and had our waiter match a glass of wine with each course. For this course we had Acustic from Montsant (Catalonia, Spain) named ‘unplugged’ in the same way that you find ‘naked’ (oak free) Chardonnay. 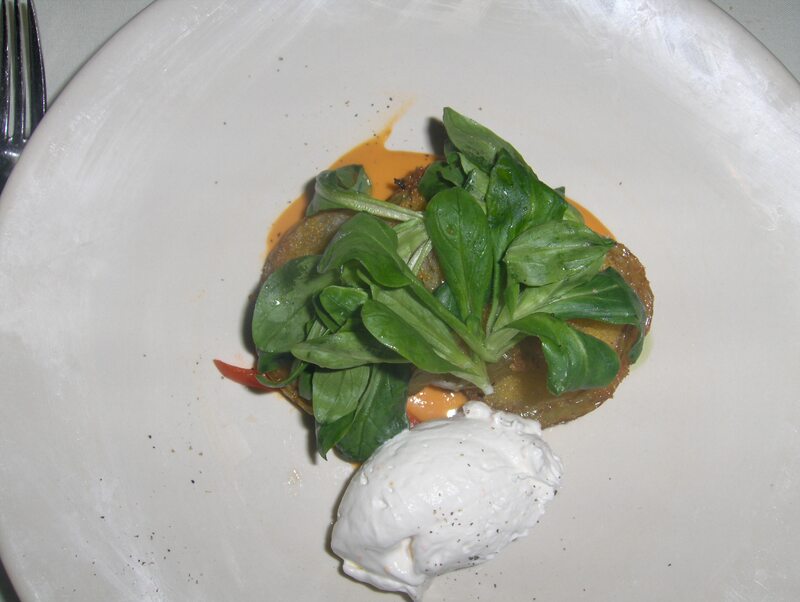 For Gary’s second course, he went for the classic southern dish Fried Green Tomatoes. The two large heirloom tomato slices were lightly battered and then pan-fried giving the tomatoes a light crunch with a soft center. Along with the tomatoes came fresh greens, creme fraise and a light tomato puree. Like an old married couple, Gary and I ended up sharing tastes from each others dishes so I can report this version of the southern classic was great. The sweetness of the fried tomatoes contrasting nicely with the spicy tomato puree. The crisp greens and silky puree matched well also. For this course, our waiter recommended the Eyrie Chardonnay from Oregon. I found the wine to have a light oakiness and a little bit fruity. A nice match for both the Fried Green tomatoes and my dish. For my second course, I also went for a southern classic in Low-Country Shrimp and Grits. I lived in Florence, South Carolina back in the 80’s so I tried grits many times but never became a big fan but when you are at Art Smith’s restaurant you give them another try. It was great!. These grits were Stone-ground White Corn Grits and so different from my memories of the 80’s. These grits were more like a risotto than the cream of wheat memories. These grits were nice and creamy as a whole but the individual grits still had a bite to them as in “el dente” pasta. A very nice consistency. The Wild-Caught Shrimp were tender, sweet and well-cooked. 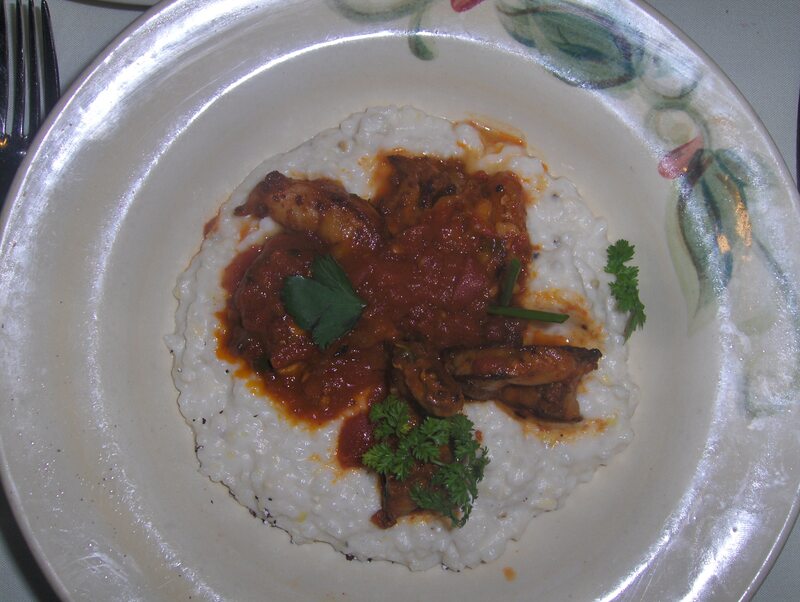 The Spicy Tomato Sauce contrasted well with the sweet shrimp and creamy grits. Basically a very simple dish but well executed with excellent ingredients. For Gary’s main course, he went for the Fish of the Day special, which was Halibut. I forgot to bring my recorder to get all the details of the dish but from my memory, the fish was pain fried and topped with a variety of vegetables and greens. I got to taste the fish and it was perfectly cooked with flakes falling off with just the touch of your folk. Halibut is my favourite fish and Table 52 did it right. 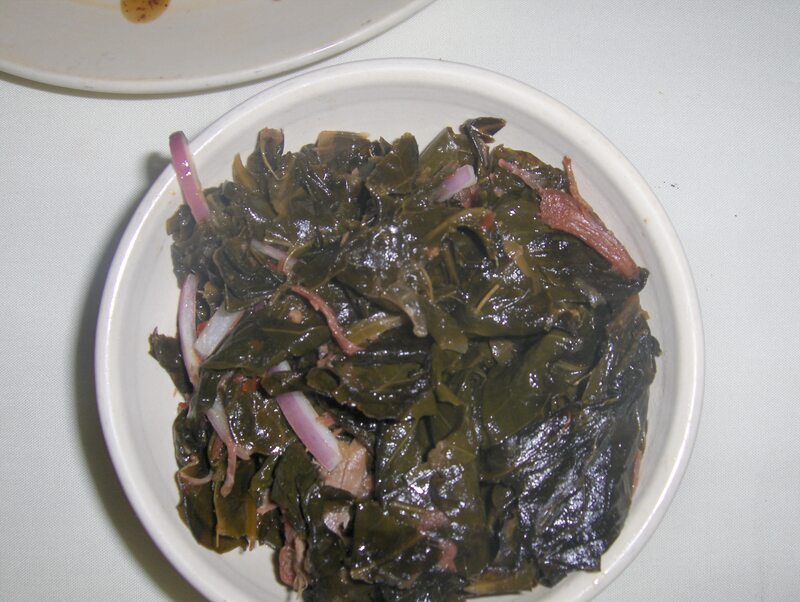 For the main course we decided to order the Braised Collard Greens with Smoked Turkey as our side dish. Collard Greens are about as “southern” as you can get but the smoked turkey was different twist I had not seen before. The more common version I had seen when I lived in the south was with ham hocks. The turkey version turned out fine with greens taking on a light sweet taste of the turkey but not the saltness of the ham version. The greens were well-cooked, infusing the turkey into the vegetable but stopping the cooking before turning the veggies into mush. This was the best dish of collard greens I have ever eaten. For my main course, I went for the Maple Sugar Short Ribs. These were the most tender short ribs I ever had in my life. Just using your fork you could twist the meat and it would flake off into single strands of flavourful meat. 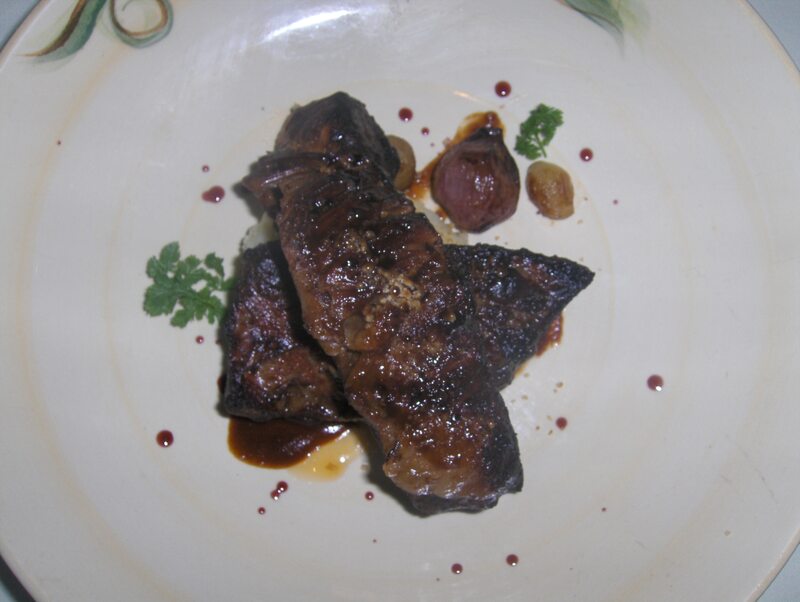 The carmelized maple sugar matched well with meaty flavours of the short rib. The dish came with red wine reduction that match well but I was so focused on the tender meat. A potato puree was the matching starch and a carmelized onion accompanied the dish. Our waiter recommended the 2007 Cristom Pinot Noir to go with the dish. I thought this was an interesting recommendation given Gary’s fish and my short rib selection but it ended up being perfect for both of us. Not overcoming the fish and not under powered for the ribs. Nice wine selecting Justin. I have had the privilege to eat in several celebrity chef restaurants; Emeril’s, Bobby Flay’s Mesa Grill, BLT Prime, Daniel, over the years but one thing was always missing, the celebrity chef. Until this visit. Making several tours of the dining room during our three courses was owner/celebrity chef Art Smith. He stopped at every table checking to see how the meal was progressing. 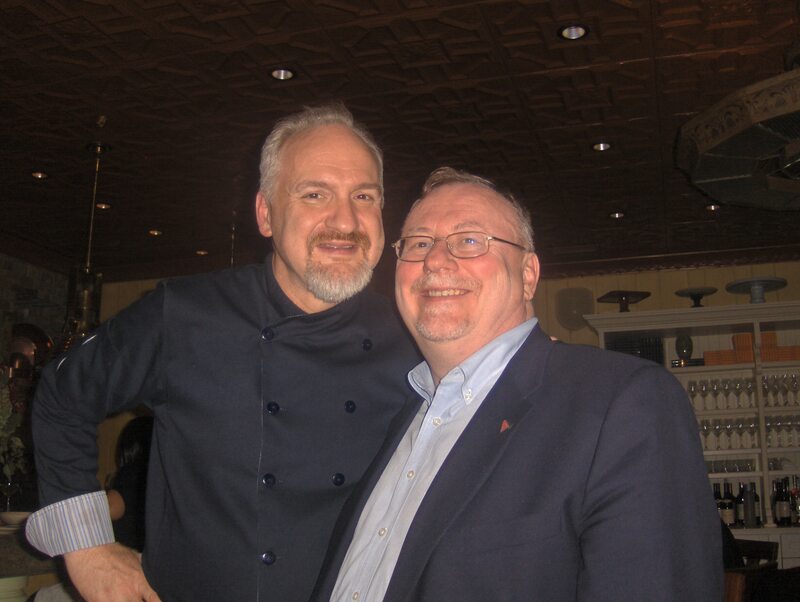 I thought the treat of the evening was going to be this photo of the two of us but it got better when Art joined us at our table as the restaurant thinned out at the end of service. They say that television puts pounds on you but this thinner and fitter version of Chef Smith has been dieting and exercising lately and looked the healthiest I have ever seen him. I wish I could say that about myself but after this great meal, I wouldn’t have much credibility would I. It gets worse, Gary and I agreed that we were going to pass on dessert as we were both pretty full from the three courses, wine and cocktails we had already consumed. But as we sat there with Chef Smith he had the staff big over some desserts for us to try. 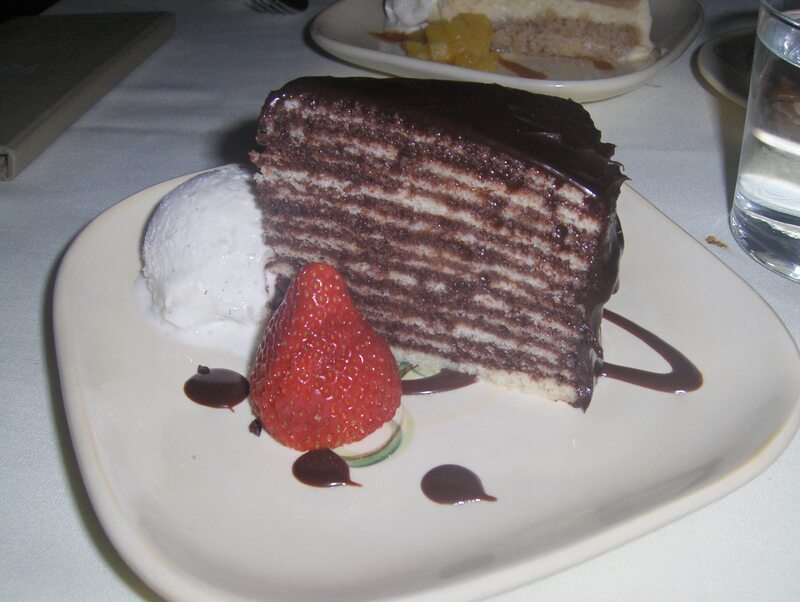 First came the Smith Family Twelve-Layer Chocolate Cake. Delicious, light and a great chocolate flavour. The cake came with Vanilla Gelato and Strawberry for contrast. Next came the Peanut Brittle. 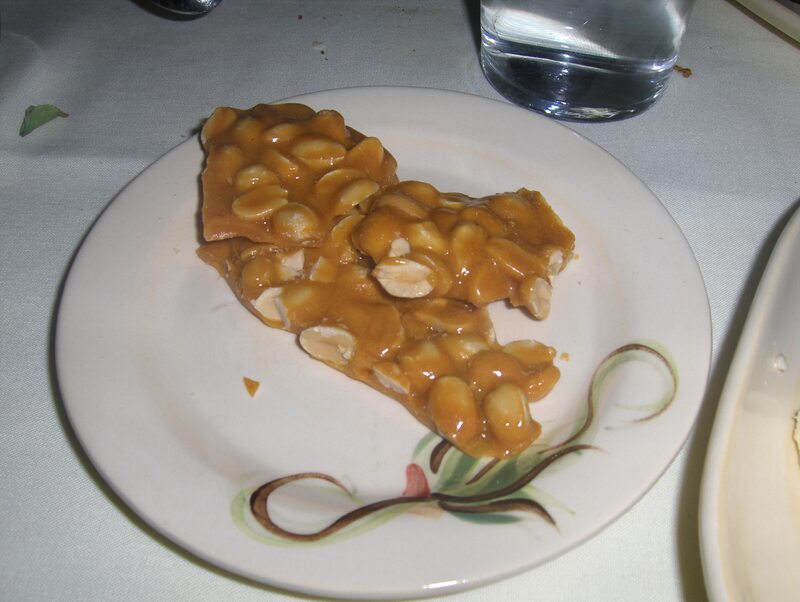 I remember peanut brittle as a Christmas treat during my childhood but this was the best brittle I ever had. The thick rich harden caramel sauce was chock full of fresh Georgia peanuts. I was amazed at how thick the brittle was. It was very good and very sweet. Finally Executive Chef John, formerly of Charlie Trotter’s restaurant, brought over Art’s Hummingbird Cake. 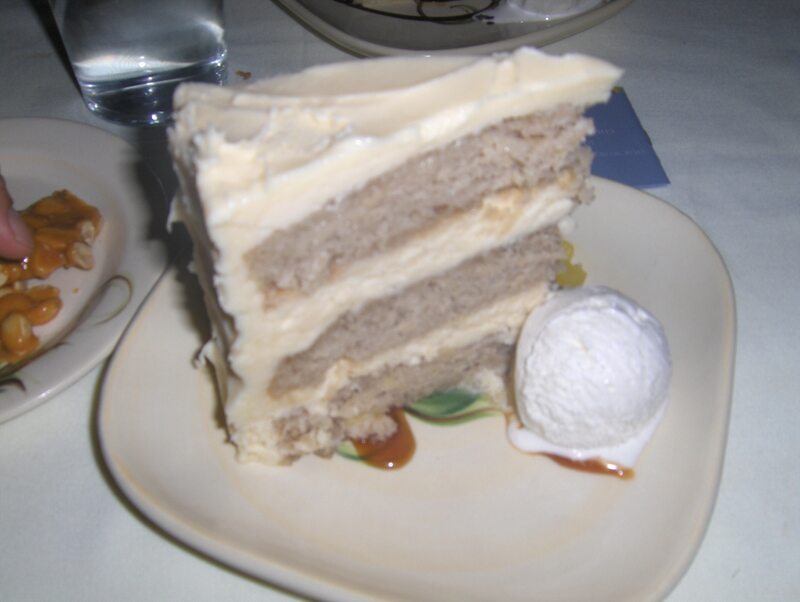 I had my share of cake when I lived in the south but never had Hummingbird cake. If I had most likely I would still be in the south cause this is great cake. Art make his version with Banana and Pineapple flavours three layers high all coated in Cream Cheese Frosting. Served on the side is a wonderful Vanilla Gelato. It was delicious with all the different flavours going on and amazingly light. We had a great chat with Chef Smith during our 30 minute sit-down talking about everything from the making of Iron Chef, his diet and exercise plan, to who’s cooking in Chicago he likes (and who’s he doesn’t) and where he likes to go hear the Blues in Chicago. The evening ending amazingly with Chef taking us to his favourite Blues Club in Chicago and having a couple of cocktails listening happily to the blues. It was an amazing meal that will, most likely, never happen again. Thanks Gary and Chef Smith for a great meal and a great story. Read other reviews about Table 52 here, here and here. I am a big fan of getting the Signature Cocktail at the restaurants I visit so when the waiter described the house special Margarita here at Pesca, I went for it and it was great. 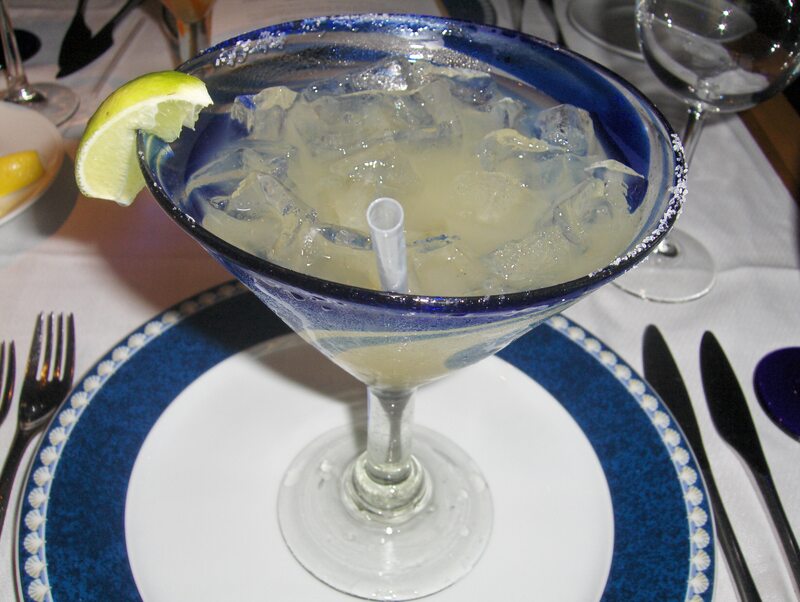 This one was made with Añejo Tequila, Grand Marnier and Lime Juice. The Anejo tequila made the drink a little smokey and a little smoother than white or silver tequila that were in most of the margaritas I have had up north in PA. The Freshly Squeezed Lime Juice provided a tartness and freshness that went along with the sweetness and orange flavours of the Grand Marnier. The top shelf ingredients required that the drink was served on the rocks with a small squeeze of lemon. Despite the cool wet temperatures that night (did I say Texas and desert later) the drink went down well. I show restrain and managed to keep to just one. We decided to share the Shells, Tails and Claws Shellfish Plateau as a group Appetizer. 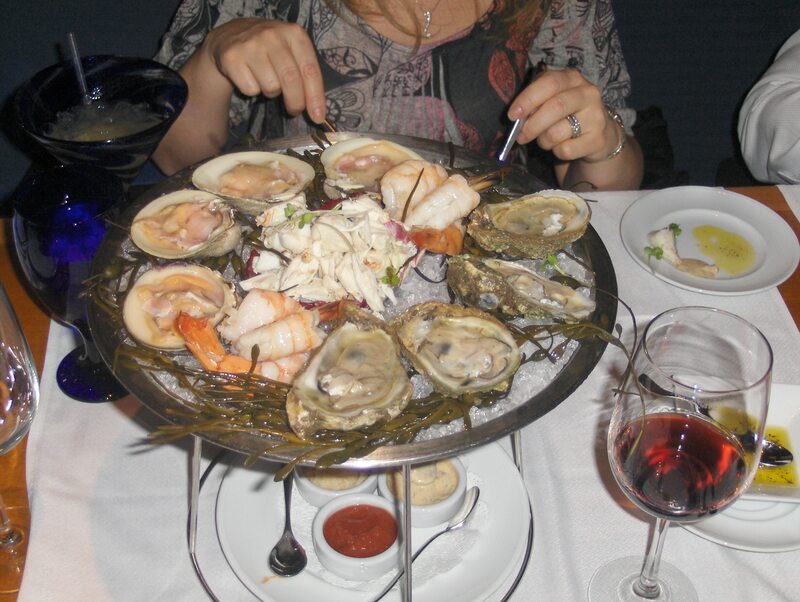 The impressive display of Clams, Oysters, Shrimp and Lump Crab Meat was a great start to a great meal. Along with the fresh seafood items came three sauces for guests to doctor (sorry couldn’t resist since we were at a medical convention) their seafood choice. The Clams were served freshly shucked and raw. I found them Sweet and Very Meaty. Their size was impressive two-three times bigger than steamers from back home. The Oysters were also fresh and large but not as big as the clams. The Oysters were both Sweet and Briney at the same time making them a study in contrast. The Jumbo Shrimp was large in size and dense to the feel but were disappointing with a lack of flavour. They were fresh but left a great deal of flavour somewhere else. 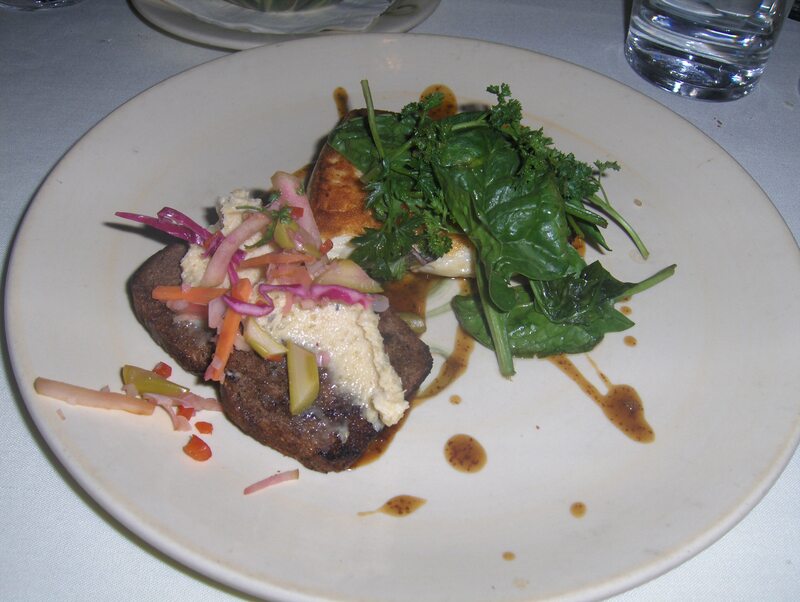 The highlight of the Plateau was the Jumbo Lump Crab – Dense, Tender and Sweet. There was no need to add sauce as the crab could stand on its own. This was a great sign for me as I had ordered the Crab Cakes for my main. The Concierge at our hotel also suggest that if we go to Pesca make sure we try the Sea Scallops. Sure enough another good recommendation as we all got to try one scallop. Served with Arugula, Lotus Root, Ginger-Sweet Chili in a Coconut Broth, the perfectly cooked scallops were excellent. Slightly carmelized on the outside, sweet and light on the inside. The Crispy Arugula and Dense Lotus Root were good contrasts to the light density of the scallops. the Ginger and Chili went well with the sweetness of density. This was the Signature Dish of the restaurant and worth getting if you visit. 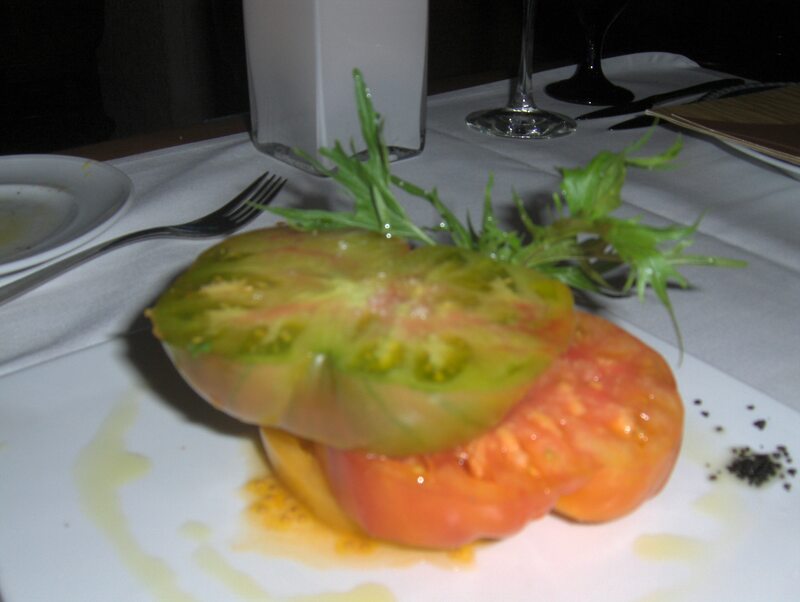 We also got to share the Heirloom Tomato Salad. The giant pieces of tomato were seasoned simply with Salt and Pepper with some Olive Oil. The simple presentation highlighted the flavours of the heirloom tomatoes that taste so different than the bright red tomatoes I usually buy at Giant Foods. This is the way tomatoes should taste. Thanks Paige. For my main course, I ordered the Crab Cakes with Dynamite Sauce. The same dense, sweet and tender jumbo pieces of crab meat in the appetizer was mixed with some bread crumbs and carefully pan-fried. The Dynamite Sauce remains a bit of a mystery but my best guess was that it was a Remoulade Sauce with some Chipotle Chilis added for some heat. The heat was good match for the sweetness of the crab meat. The crust from the pan frying contrasted to the tender crab meat inside the cakes. 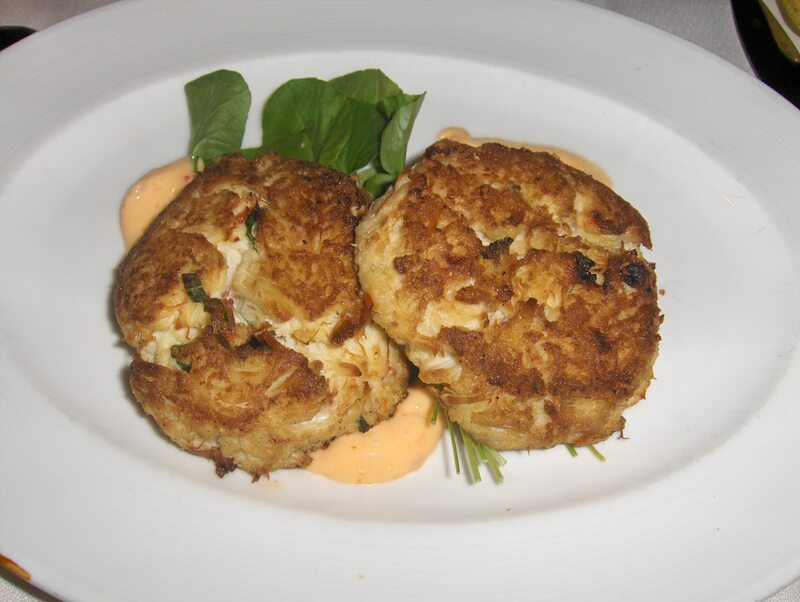 Excellent crab cakes that would give Maryland a run for their money. For sides, we ordered family style and got (against my initial instincts) Quinoa supposedly the healthiest grain available on the earth and Deep Fried Sweet Potatoes. Both were well-cooked and great matches for the different fish dishes the group ordered. The large portions of appetizers, heirloom tomatoes and entrees made dessert in the desert impossible for the group. We manage to barely complete the mains before calling it a night. But before we left Restaurant Manager Michael McClellan stopped by to ensure we had a great meal and to invite us to Pesca’s sister restaurant Las Canarias next time we are in San Antonio. Las Canarias looked great and a target for next time. Thanks to gang for making the evening great. We all shared a great meal and working for a great company. The conversation was as a good as the food and that was really good. I look forward to eating with them again. Make sure you get to the Riverwalk if you go to San Antonio and if you are looking for seafood try Pesca. Read other reviews here, here and here. I wanted to get together with Amy to catch up and learn from her about online strategies for Managed Markets. I have known Amy for many years since she was doing Media Strategies for our Pharma brands and Internet Media was just starting. Amy has moved on to Managed Markets which is becoming very important to many brands. So where do we eat in New Brunswick? 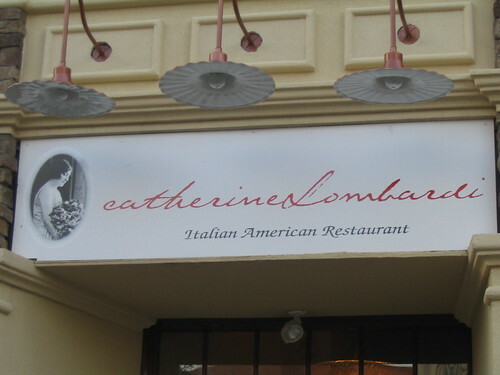 I suggested we go to Catherine Lombardi’s for some classic American Italian Food. The well decorated dining room also allows enough privacy for a business meeting a great food to nourish us. So Amy agreed to meet me there. Amy went for the Pappardelle with Bolognese as her main course. I wasn’t familiar with the pasta Pappadelle so Alex, who did a great job serving us so well with her partner Scott, explained that it was kinda like “Fettuccini that had been run over by a steam roller”. Alex and Scott are exactly who you want to see serving you at any meal, attentive, informative and professional. Great job guys. I hope to see you again. Amy shared with me that the pasta was perfectly cooked and meat sauce was very satisfying. I went for the Daily Ravioli Special for my main course. Since Fall had just started the Squash and Cheese Ravioli with Sage Brown Butter Cream Sauce sounded perfect for a sunny Fall day in New Brunswick. The store made ravioli were perfect with a great blend of squash and cheese, perfectly cooked with a drop of Pumpkin Oil on each. The Brocolli Rabe was a perfect side with the pasta as it brought some bitter and garlic taste to the party matching well with sweet squash and cheese. It was a delicious dish, well balance and perfect for the season. Well done. It took a great deal of persuasion, but I managed to convince Amy to have some dessert. After review all the delicious choices she selected my favourite dessert at Catherine Lombardi’s, the Zabaglione with Fruit. Most of the times I have had this Classic Italian Custard, it has come with Strawberries but today it came with Blueberries. The light custard was sweet with the tart berries making a nice contrast . I had to try something different from Amy so that I could share with the readers the experience. What I do for my readers. LOL. I went for the Canolli. Come to find out they bake their own shells and then fill them on demand. The filling, Alex warned was not as sweet as other canolli but the blend of Sweetened Mascarpone and Ricotta Cheese with some Orange Zest would be less sweet than I was used to but it would be very good. The two canolli arrived on a giant plate with a dusting of Pistachio Nuts, Chocolate pieces and Powdered Sugar. Alex was right, it was a great change from the super sweet pastries you can get everywhere and a great end to a great lunch. Thanks Amy for playing along with my hobby, taking photos and helping me understand the state of the art of online marketing in the Managed Market space. I hope we get to do this again. Read other reviews about Catherine Lombardi’s here, here and here. Steamed Clams always make me think of summer and my Aunt Bert’s camp in L’Etete, Canada. My aunt Roberta, who we always called Bert introduced me to Steamed Clams or “Steamers” on a visit to her waterfront cottage in L’Etete when I was about 10 years old. She steamed her’s in a little bit of water and served them with butter, lemon and vinegar. As a 10 year old I found the clams to be amazing, sweet, salty, tart and sour all at the same time. It was an eye’s opening experience to me that something as weird looking as clams could taste that good. So when Cafe Europa put on their “Steamers” appetizer I couldn’t resist and ordered them. I felt a little like the critic in “Ratatouille” when I put the first mollusk in mouth and flashed back to Aunt Bert’s camp and her clams. The steamers were sweet, salty, tart and sour again and they made me feel good. Try the Steamers at Cafe Europa and I hope they bring you back to the first time you tried them. If it’s your first time to try steamers, then Cafe Europa is a good place to start. LOL. Enjoy what’s left of your summer. Donna and I were hungry Sunday afternoon so we headed south to Washington’s Crossing to have a burger at the Lion Heart Pub but unfortunately it had closed and was under renovation to become an Italian restuarant next month. Instead we headed towards Newtown in search of a decent burger and new place to post about. We drove by Issac Newton’s, knowing they had great burgers but I wanted a new place to post about. We ended up at the Clubhouse Bar and Grill. We grabbed seats on the outdoor patio as it was sunny and warm. Donna ordered the Potato Skins and Chicken Wings and I went for the Burger and Pizza Fries. The Potato Skins, turned out to be the best appetizer of the meal. The standard portion of four skins were generously filled with potato, Cheddar Cheese and real Bacon. The dish comes with Sour Cream on the side but Donna doesn’t use it. The skins were a little dry so Donna used some of the Blue Cheese Dressing from the wings to give the skins a little more tang and some moisture. The skins componets are a classic mixture of tastes and textures making them an easy order here at the Clubhouse or just about any decent bar or restaurant. Donna’s Chicken Wings looked promising as they arrived at the table but turned to average as we tasted them. These were the Biggest Wings I have seen yet in Bucks County but the lack of a crisp skin got them rated as average. They were cooked thoughout but could have used a few minutes more to crisp the skin. The Hot Sauce dressing was simply hot sauce and margerine leaving a big opportunity to flavour the wings rather than just make them “hot”. The dish did come with Carrots and Celery, both of which rarely come together here in Bucks County but the Blue Cheese dressing was lacking Blue Cheese morsels to give it any tang or texture. So these wings ending up being average for us. Not bad just not up the standard set by other restaurants on the Best of Bucks – Top 5 Wings list created here on the blog. My Bacon and Bleu Burger came with a good sized burger patty, two real Bacon slices, Lettuce and Tomato with Dill Pickle and Potato Chips on the side. Also on the side was an addition serving of the Blue Cheese dressing to serve as the Bleu portion of the burger. I was disappointed that it was dressing rather than actual Blue Cheese morsels that I had gotten at other places here in Bucks County. The medium rare turned out to be medium well so the dressing did come in handy giving the burger some much needed moisture. The untoasted bun was decent and fresh but could have been improved by a few minutes on the grill. It was an OK burger but there are better choices here in Bucks County. Check out the Best of Bucks Co list for suggestions. Sometimes you get what you order and it doesn’t taste like you thought it would. The Pizza Fries that day were an example of that. I knew my burger would come with potato chips so I wanted some fries to go with the burger. 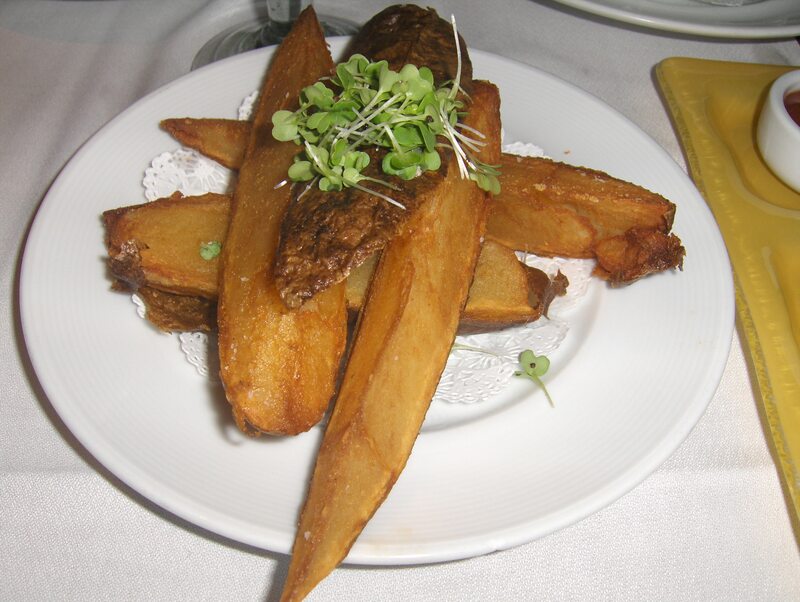 The Clubhouse menu offers a half-dozen different kinds of fries but for some reason the pizza fries sound the tastest. Our waiter described them as a large order of fries, covered in Marinara Sauce and Mozzerella cheese. And that’s exactly how them came but unfortunately the dish didn’t work for me. Somehow the marinara sauce came across as being slightly metalic and not at all like a pizza sauce I was dreaming about when I ordered. We both had several trys at them and as time when on the fries got soggy. The cheese was good by itself but the combo didn’t work for us. It might work for you but it didn’t work well for us. Least we know. Net-net we had average appetizers a decent outdoor patio. If you are looking for a great place for Wings or Burgers, try the Best of Bucks County Top 5 Lists. Let me know what you think about the Clubhouse below in the comment box. Read other reviews about the Clubhouse here, here and here. Facebook friend and Social Media expert Jay and I met for lunch this week in Princeton at Mediterra. Jay has been working with online communities since the early days of the gated AOL communities so he knows alot about how best to make them work and the issues you have to deal with if you decide to sponsor one and want to make it work. I learned a lot that day but let me share my review of our appetizers. Jay had the Beet Gazpacho Soup special and I went for the Charcuterie. The beet soup is presented with the veggies and croutons in the bowl and the broth poured into the bowl table side. Very nice. Jay liked the soup. Although it looked very thick to me, Jay thought the consistency was very nice. He found a mild Beet flavour coming out of the puree, Cucumber flavour coming through too and a good but not strong Gazpacho Spice in the soup. The Croutons added some crunch to the soup. Good looking soup, well presented and good flavours. I like pate and here in the US, it rare to see it on the menu so when I saw that the Charcuterie came with pate, I had to try it. The menu describes the dish as being “Artisanal salumi, cured meat & pate, mustard, olives & cornishons” . The actual Pate was very nice with ground chicken livers, spices and pistachio nuts. Nice consistency and nicely spiced. Two different breads came with it, slightly toasted and really crispy. The cured meats and salami included store-made versions of Spicy Salami, Genoa Salami, Prosciutto and Capicolawere delicious. Each slightly different than the others. The spicy salami had some heat but not overwheling, the Genoa salami was slightly salty but the pork meat was sweet making a nice contrast, prosciutto was mild and slightly fatty, and completing the set was very mild capicola. The Ground Mustard was hot and Pickles crunchy making a great appetizer with the different combinations of meat, pickles, breads and mustard. Jay has a side-line business of taking wedding photos so it made sense for me for him to take the photos and I thought he did a great job. Let me know if you need a good photographer. I have been at Mediterra a few times and here is the link to an earlier post that describes some other appetizers I had there. The info is towards the end of the post so scan thru it. Read other reviews about Mediterra here, here and here. It was a beautiful day here in Bucks County. Any day without rain is now considered beautiful, LOL, but it really was nice so we went for a drive along the Delaware River to Lower Bucks. The road along the river stops conveniently right beside The Yardley Inn so we decide to have a beverage in their very comfortable bar. We were both still stuffed from our lunchtime visit to Basically Burgers (excellent burgers BTW) in Doylestown so we stuck to just drinks even though the Inn has a great bar menu. 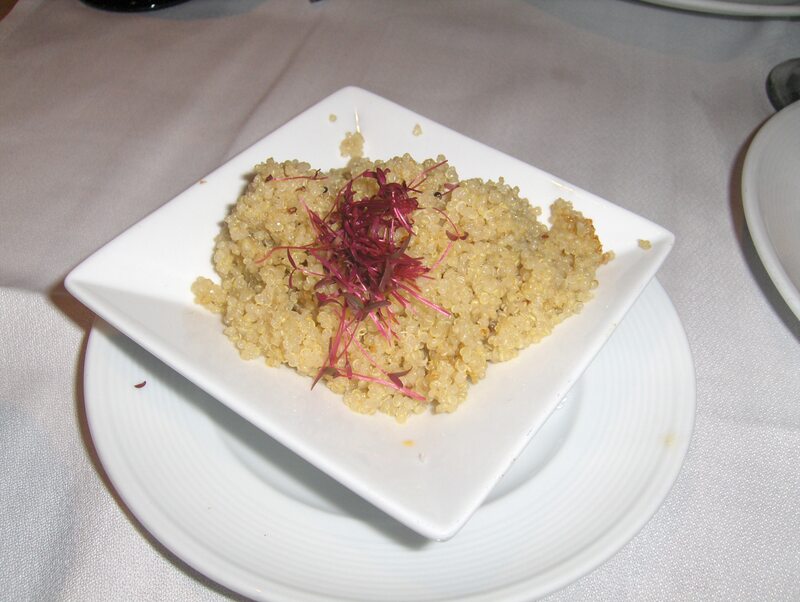 We have tried in the menu in the past and recommend you try the Tiers of Taste if you go. It’s three levels of great appetizers and you get to chose 3 items from mini crab cakes, hot wings, spring rolls, different dips, calamari, meatballs, deviled eggs or roasted peppers. Read other review about the Yardley Inn here, here and here.